© Gu et al. ; Licensee Bentham Open. Adenovirus type 5 (Ad5) achieved success as a conventional transgene vaccine vector in preclinical trials, however; achieved poor efficiency in some of the clinical trials, due to the major hurdle associated with Ad5 pre-existing immunity (PEI) in the majority of the human population. We sought to generate Ad5-based chimeras to assess their capabilities to bypass this bottleneck and to induce antigen-specific humoral immune response. A His6 tag was incorporated into the hypervariable region 2 (HVR2) of hexon3 (H3) capsid protein using the “Antigen Capsid-Incorporation” strategy. This lead to the construction of a viral chimera, Ad5H3-HVR2-His. Ad5H3 was generated previously by substituting the hexon of Ad5 (hexon5) with the hexon from adenovirus type 3 (Ad3). His6 was presented on the viral capsid surface and recognized by a His6 antibody. An in vitro neutralization assay with Ad5 sera indicated the ability of Ad5 chimeras to partially escape Ad5 immunity. 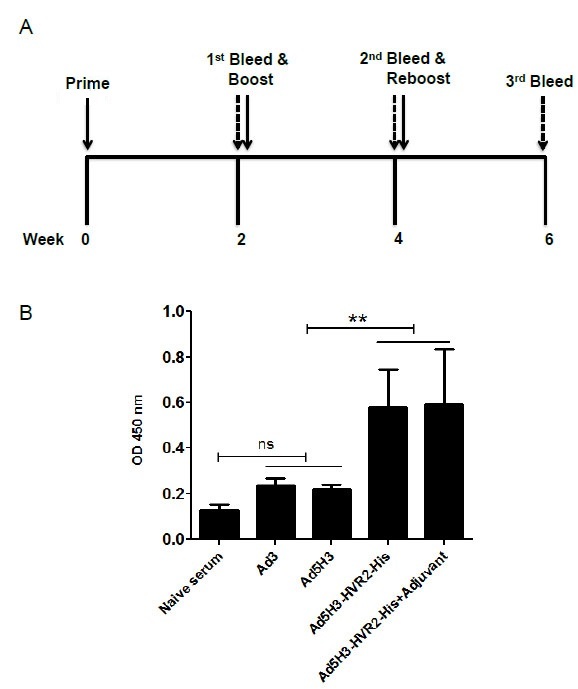 Immunization with Ad5H3-HVR2-His generated significant humoral response to the incorporated tagged peptide, when compared to the immunizations with controls. Based on our in vitro studies the data suggested that Ad5H3 as a novel chimeric vaccine platform yields the possibility to escape Ad5 neutralization, and the potential to generate robust humoral immunity against incorporated antigens using the “Antigen Capsid-Incorporation” strategy. Keywords: Adenovirus type 3 (Ad3), Adenovirus type 5 (Ad5), Ad5 pre-existing immunity (PEI), Antigen Capsid-Incorporation strategy, Chimeric Ad5H3, Humoral immunity. Adenovirus type 5 (Ad5) has been the most studied virus for vectored therapies, due to the vector’s advantages in genetic modification and host applicability . However Ad5’s major disadvantage is its pre-existing immunity (PEI) in the majority of the human population. This disadvantage could decrease the efficacy of Ad5-vectored clinical therapies . Ad5 neutralizing antibodies (NAbs) generated against capsid proteins play the primary role in the contributions to Ad5 PEI [3, 4]. Most recombinant Ad5 vectors are based on the traditional transgene method, which replaces the Ad5 early genes (E) with foreign genes of interest. These types of vectors are easily neutralized by Ad5 NAbs. Several methods have been developed to circumvent Ad5 PEI. These include using rare Ad serotypes , coating Ad5 capsid proteins with toxicity-deficient chemicals to mask Ad5 neutralizing epitopes  and generating Ad5 chimeras by replacing Ad5 NAbs-targets (hexon, fiber or penton) with those from other Ad serotypes. Studies showed that replacement of Ad5 hexon with Ad48 hexon could help viral vectors escape neutralization by Ad5-positive sera , and the replacement of Ad5 fiber with Ad35 fiber could moderately escape Ad5 PEI, contributing to the protective immunity against infectious disease . Notably, chimeric Ad5H3 was generated by switching Ad5 hexon with Ad3 hexon, and demonstrated promise in bypassing Ad5 PEI . Although Ad5H3 appeared to hold great potential, this vector was developed primarily as a vector for cancer gene therapies . Our study herein, focuses on the further development of chimeric Ad5H3 for vaccine approaches. Specifically, our study focuses on combining the chimeric Ad5H3 vector with the “Antigen Capsid-Incorporation” strategy. The “Antigen Capsid-Incorporation” strategy is a genetic approach whereby antigen(s) of interest are directly displayed on the viral capsid surface. This strategy not only holds the potential to bypass Ad5 PEI through modifications of Ad5 neutralizing epitopes on capsid proteins , but also elicits robust immunity by directly presenting the antigens of interest to the host immune system, leading to the protection against infections [11, 12]. Our group has advanced this strategy for the development of Ad5-vectored vaccine approaches [13-15]. This strategy has also been applied with other Ad serotypes for vaccination approaches [16, 17]. Based on the above achievements in generating Ad5 chimeras such as Ad5H3, we utilized the “Antigen Capsid-Incorporation” strategy to generate Ad5H3-HVR2-His by incorporating His6 into hypervariable region 2 (HVR2) within hexon3 of the chimeric Ad5H3. We focused on the potential of this chimeric vector in circumventing Ad5 sera neutralization and acting as an alternative vaccination vector/approach. Chimeric vector Ad5H3 was generated by transfecting the plasmid pAd5/H3 (GL) into HEK 293 cells as previously described. Ad5H3 was upscaled as previously described . In this study, the chimeric Ad5H3-HVR2-His was generated by incorporating His6 into the HVR2 of H3 capsid protein, using the “Antigen Capsid-Incorporation” strategy. In detail, a fragment of the gene of interest (AscI-H3-HVR2-His-BstXI) was synthesized (GenScript, Piscataway, NJ) with the His6 sequence located between amino acids motifs “LQIG” and “KDI” within HVR2. This fragment was digested with restriction enzymes AscI and BstXI, and ligated into the shuttle plasmid H3/pH5S linearized with AscI and BstXI  to form H3/pH5S-HVR2-His. H3/pH5S-HVR2-His was digested with EcoRI and PmeI to extract the fragment 5’ homologous-H3-HVR2-His-3’ homologous. Homologous recombination was performed by co-transforming the 5’ homologous-H3-HVR2-His-3’ homologous fragment with Swal-linearized backbone plasmid pAd5/ΔH5 (GL) into commercial E.coli strain BJ5183 competent cells (200154, Agilent Technologies, Wilmington, DE). The colonies were screened by PCR with two sets of primer pairs, each specific to the backbone plasmid or H3-HVR2-His fragment, to identify the correct clones. The positively screened recombinant plasmids were then sequenced through the entire H3-HVR2-His gene with a list of primers. The correct plasmid was named pAd5/H3-HVR2-His (GL) and transformed into DH5a competent cells in order to maintain the stable recombinant. pAd5/ΔH5 (GL) was generated as described previously . The plasmid pAd5/H3-HVR2-His (GL) was linearized with PacI and transfected into HEK 293 cells. Once plaques formed, the rescued vector was upscaled, purified and titrated for both physical titer (VP/ml) and infectious titer (IP/ml), as previously described . The purified virus was named Ad5H3-HVR2-His. To confirm the replacement of hexon5 with hexon3 on chimeric Ad5H3-HVR2-His at the DNA level, viral genomes from control vectors (Ad5 , Ad3 and Ad5H3) and experimental vector Ad5H3-HVR2-His were extracted as PCR templates. The hexon3 specific primer pair was 5’-CTCGCTCCTAAGGGCGCGCCCA (Forward) and 5’-CCTGAAGCCAATGTAATTGG (Reverse). The PCR products were analyzed by DNA gel electrophoresis. Coommassie blue staining analysis was employed to investigate whether the His6 incorporation would affect the viral structure integrity. Ad5, Ad3, Ad5H3, and Ad5H3-HVR2-His vectors (3 x 1010 VP) were run and analyzed by sodium dodecyl sulfate polyacrylamide (SDS-PAGE) and coommassie blue staining. The gel was stained at room temperature with coommassie blue for 2.5 hours and destained with distilled water for 4 hours. To confirm the incorporation of His6 tag into the hexon3 protein of chimeric Ad5H3 vector at the protein level, Ad5H3-HVR2-His and negative controls (Ad3 and Ad5H3) were resolved in polyacrylamide gel and transferred unto polyvinylidene fluoride (PVDF) membrane. The PVDF membrane was blotted with mouse anti-His antibody (A00186, GenScript, Piscataway, NJ), followed by incubation with goat anti-mouse IgG-HRP antibody (AP124P, Millipore, Billerica, MA). The detailed ELISA procedures were described elsewhere . To confirm the antigenic presentation and surface-exposure of His6 on the chimeric vector, Ad5H3-HVR2-His and negative controls (Ad3 and Ad5H3) were individually coated in duplicate in an ELISA plate. The coating was performed by increments of 2-fold serial dilutions. The plate was subjected to incubation with mouse anti-His antibody followed by goat anti-mouse IgG-HRP antibody. The plates were washed and developed with SIGMAFAST OPD peroxidase substrate. OD 450 nm was measured on an Emax microplate reader. To investigate the binding capabilities of different Ad vectors to Ad5-positive mice sera, positive control (Ad5) and experimental vectors (Ad3, Ad5H3, and Ad5H3-HVR2-His) were individually coated in triplicate at 6 x 108 VP. Ad5-positve sera from three mice were individually applied into the plate in a 2-fold serial dilution method. The plate was then incubated with goat anti-mouse IgG-HRP antibody. The plates were washed and developed with SIGMAFAST OPD peroxidase substrate. OD 450 nm was measured on an Emax microplate reader. To evaluate whether Ad5H3-HVR2-His could generate humoral immunity against His6 tag, KDI peptide (LQIGHHHHHHKDITTTE) was coated at 10 μM. Sera in seven replicates from each immunization group (Ad3, Ad5H3, Ad5H3-HVR2-His and Ad5H3-HVR2-His + Freund’s adjuvant) as well as sera from unimmunized controls were diluted at 1:100 and applied into the plate. Goat anti-mouse IgG-HRP antibody was then added. The plates were washed and developed with SIGMAFAST OPD peroxidase substrate. OD 450 nm was measured on an Emax microplate reader. OD absorbance at 450 nm represents KDI-His6 antibody levels in the sera. To determine the abilities of different Ad vectors in escaping neutralization by Ad5-positive mice sera, sera-based neutralization assay was conducted. Anti-Ad5 mice sera were diluted into a final working concentration (10x, 100x, 500x, 1,000x and 5,000x). Vectors (Ad5, Ad5H3 and Ad5H3-HVR2-His) were diluted at 5 IP/cell. Diluted sera and vectors were co-incubated for 60 minutes, and then added to HeLa cells, followed by an 2-hour incubation. Thereafter, complete culture medium was added to form a final 1ml/well volume. The group of vectors without sera treatment was considered as positive controls. Neutralization was measured as a function of luciferase (luc) expression in the HeLa cells. Ad5, Ad5H3 and Ad5H3-HVR2-His contain the luc gene which can be quantitated after expression. Cells at 24 hours post-infection were harvested in Reporter Lysis Buffer (Promega, Madison, WI), and luc expressions were quantified on a B12 Luminometer (Berthold Detection Systems) using the Luciferase Reporter 1000 Assay System (Promega, Madison, WI). Data from each vector were presented directly as luciferase readouts, termed as relative luminescent unit (RLU). Female BALB/c mice (seven per group) were immunized, respectively, with the following vectors: Ad3, Ad5H3, Ad5H3-HVR2-His and Ad5H3-HVR2-His + Freund’s adjuvant [F 5881 and F 5506, Sigma, Saint Louis, MO]) to detect the His6-specific humoral immunity. Mice were intramuscularly immunized with relevant vectors (1 x 1010 VP/mouse) at each time-point, with a two-week interval between each two time points. The University of Alabama at Birmingham Institutional Animal Use and Care Committee approved the use of mice as described herein under the approved protocol number 101109272. Descriptive statistics, such as means and standard deviations, were computed to study variables of interests. Statistical analyses were performed using unpaired student’s t-test and One-way ANOVA. Statistical significance was defined as follows: p<0.05 (*), p<0.01 (**), p<0.001 (***). Schematic of genetic construction of plasmid pAd5/H3-HVR2-His (GL). The gene of interest AscI-H3-HVR2-His-BstXI was digested with restriction enzymes AscI and BstXI, and ligated into the shuttle plasmid H3pH5S to form H3/pH5S-HVR2-His. 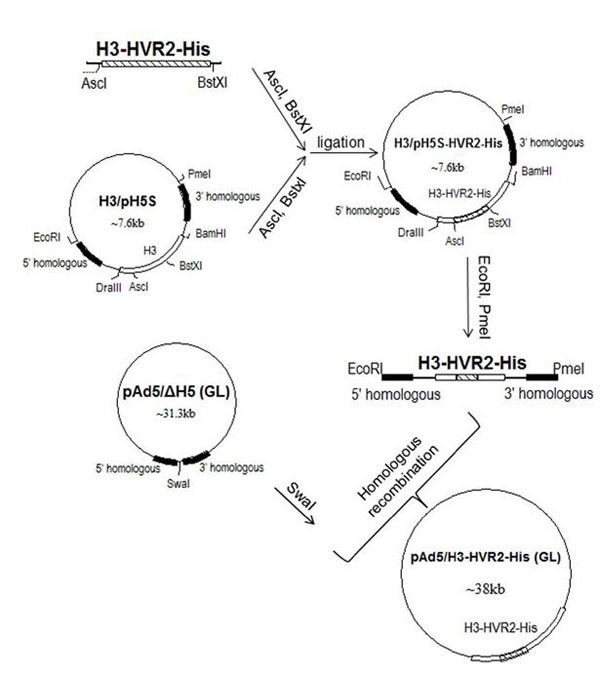 H3/pH5S-HVR2-His was then digested with EcoRI and PmeI, resulting in the production of a fragment containing homologous arms for recombination and the gene of interest. The fragment was then recombined with SwaI-linearized pAd5/ΔH5 (GL) by interaction of homologous arms. The resulting recombinant plasmid was named pAd5/H3-HVR2-His (GL). A His6 tag was incorporated into the HVR2 of the hexon3 protein on Ad5H3 using the “Antigen Capsid-Incorporation” strategy, leading to the construction of the plasmid, pAd5H3-HVR2-His (GL) (Fig. 1). HVR2 was selected as an incorporation site because it has been previously reported that H3-HVR2 could sustain a foreign epitope incorporation. The plasmid was transfected to generate the viral vector, Ad5H3-HVR2-His. The viral genome was extracted for the PCR detection of the hexon3 gene, and the results showed positive PCR product in the positive control vectors Ad3 and Ad5H3 as well as the experimental vector Ad5H3-HVR2-His, but not the negative control Ad5 (Fig. 2A). These data indicate that at the gene level hexon5 was replaced with hexon3, and His6 tag was incorporated in hexon3. 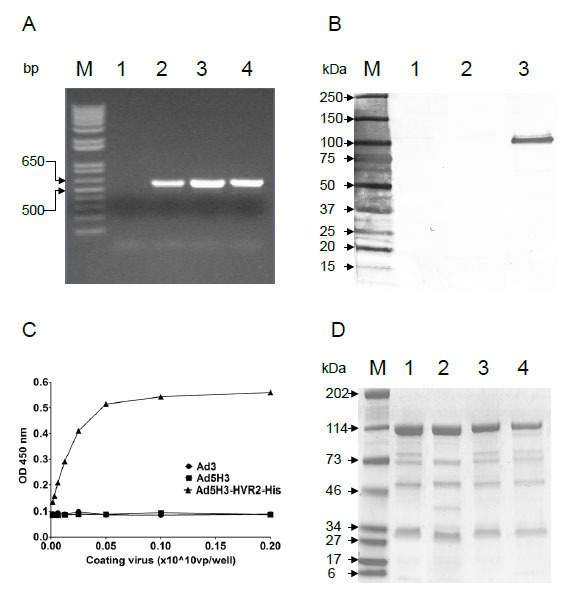 Western-blot analysis detected the His6 tag only in Ad5H3-HVR2-His (Fig. 2B). To confirm the antigenic presentation and surface-exposure of His6 on the chimeric vector Ad5H3-HVR2-His, whole virus ELISA was performed (Fig. 2C). Ad5H3-HVR2-His and negative controls (Ad3 and Ad5H3) were individually coated in duplicate in an ELISA plate, followed by probing with His6 antibody and appropriate secondary antibody. The data indicate substantial His6 antibody binding to Ad5H3-HVR2-His, whereas, there was no binding to Ad3 or Ad5H3. Fig. (2C) suggests that His6 was exposed on the surface of Ad5H3-HVR2-His. Fig. (2). Validation and characterization of the chimeric vector. (A) To demonstrate the hexon switch on Ad5, PCR was utilized to detect the hexon3 gene from viral genomes of vectors. Lanes 1 through 4 are ordered as follows: Ad5, Ad3, Ad5H3 and Ad5H3-HVR2-His. (B) To demonstrate the incorporation of a His6 tag into hexon3 on chimeric Ad5H3, western-blot analysis was performed. Lanes 1 through 3 in panel B are as follows: Ad3, Ad5H3, and Ad5H3-HVR2-His. (C) In order to verify His6 surface display on the vectors, ELISA assays were performed. (D) Coommassie blue staining analyses was carried out to demonstrate that the “Antigen Capsid-Incorporation” strategy would not affect the adenovirus structural integrity. Lanes 1 through 4 are ordered as follows: Ad5, Ad3, Ad5H3 and Ad5H3-HVR2-His. Coommassie blue staining analysis was employed to investigate whether the His6 incorporation would affect the viral structure integrity. Ad5, Ad3, Ad5H3, and Ad5H3-HVR2-His were run and analyzed by SDS-PAGE followed by commassie blue staining. As seen in Fig. (2D), the control vectors Ad5 (lane 1) and Ad5H3 (lane 3) showed the same pattern of protein separation, and the other control vector Ad3 (lane 2) showed a pattern similar to Ad5 and Ad5H3, but with slight difference. By referring to the controls, it is feasible to identify that the chimeric vector Ad5H3-HVR2-His (lane 4) has a similar protein separation pattern to Ad5 and Ad5H3. This suggested that the His6 tag incorporation did not affect the viral structure integrity. The physical titer and infectious titer of Ad5H3 were determined at 7.3 x 1011 VP/ml and 2.8 x 109 IP/ml, separately, which contributed to the VP/IP ratio at 260.7 (Table 1). The two titers of Ad5H3-HVR2-His were determined at 7.5 x 1011 VP/ml and 1.4 x 1010 IP/ml, separately, which contributed to the VP/IP ratio at 53.6 (Table 1). The titers and ratio indicated good fitness of Ad5H3 and Ad5H3-HVR2-His. Above all, the data suggested that a vector which contained a hexon3 modified protein in combination with other Ad5 capsid proteins can be encapsulated in the Ad5 genome, forming the chimera Ad5H3-HVR2-His, without harming the adenoviral structure and fitness. The His6 tag incorporation also suggested the possibility of incorporating alternative antigens into the hexon3 capsid protein in combination with the incorporation strategy. Fig. (3). Chimeric vectors have reduced binding and neutralization by Ad5-positive sera in vitro. (A) Whole virus ELISA was conducted to assess the binding capabilities of Ad5, Ad3, Ad5H3, and Ad5H3-HVR2-His to Ad5-positive mice sera. The data in the ELISA assays were represented as the Mean ± SD from three independent repeats. Neutralization assays were performed with (B) Ad5 as assay system’s positive control, (C) Ad5H3, and (D) Ad5H3-HVR2-His. The horizontal axis indicated Ad5-positve sera dilutions, among which, the number 0 indicated no sera treatment. The data in the neutralization assays were represented as Mean ± SD from three independent replicates. Statistical analyses were performed using unpaired student’s t-test. Whole virus ELISA assay was conducted to evaluate the binding capabilities of different Ad vectors to Ad5-positive mice sera. Ad5, Ad3, Ad5H3 and Ad5H3-HVR2-His were bound to an ELISA plate, respectively. Ad5-positve sera were individually applied into the plate in serial dilutions. The plate was then incubated with goat anti-mouse IgG-HRP antibody and absorbance was measured at 450 nm. The results in Fig. (3A) showed that as a positive control, Ad5 consistently bound the highest to the sera among all the dilution points; as a negative control, Ad3 consistently bound the lowest to the same sera, and achieved statistical differences among all the dilution points except 12,800x, when compared to Ad5. Ad5H3 and Ad5H3-HVR2-His yielded binding signals ranging between Ad5 and Ad3. Statistical analyses determined the significant binding differences between the chimeric vectors and Ad5, when the sera dilutions were set at 1,600x (p<0.05), 3,200x (p<0.05) and 6,400x (p<0.05). This set of data demonstrated that Ad3 had minimal binding to Ad5-positive sera due to the serotype difference, while chimeric vectors (Ad5H3 and Ad5H3-HVR2-His) had moderate binding to Ad5-positive sera, which was significantly lower than the Ad5 binding to the same sera, suggesting the potential escape ability of the chimeric vectors to Ad5 humoral immunity. Based on the findings in the binding assay, an in vitro neutralization assay was performed, to demonstrate the capability of the chimeric vectors to circumvent the Ad5 humoral immunity. The vectors (Ad5, Ad5H3 and Ad5H3-HVR2-His) were diluted and incubated in varying concentrations of Anti-Ad5 mice sera. The diluted sera and vectors were then used to infect HeLa cells. Ad5 neutralization was measured as a function of luciferase (luc) expression in the HeLa cells. In the assay, the system’s positive control, Ad5, was thoroughly neutralized by Ad5-positive sera at all the sera dilutions ranging between 10x and 5,000x (p<0.001) (Fig. 3B). In contrast, both Ad5H3 (Fig. 3C) and Ad5H3-HVR2-His (Fig. 3D) have reduced neutralization by Ad5-positive sera when the same sera were diluted at 1,000x and 5,000x (p>0.05). These findings inherently shared consistency with the above binding assay, in that the binding of Ad5 to Ad5-positive sera was significantly higher than the binding of chimeric vectors to the same sera, when the sera dilution was between 1,000x and 6,400x. Ad3 was not included in this neutralization assay, because Ad3 doesn’t contain the luciferase gene. Fig. (4). Induction of antigen-specific humoral immunity by chimeric vector via the “Antigen Capsid-Incorporation” strategy. (A) Schema of “prime-boost” regimen in BALB/c mice. The solid lines with arrow denote the time of prime, boost, and reboost. The dotted lines with arrow denote the time of bleeding post injection. (B) KDI peptide (LQIGHHHHHHKDITTTE) was coated in the sera-based ELISA to test the binding of the peptide to sera from the four immunization groups. The groups analyzed were unimmunized mice, Ad3, Ad5H3, Ad5H3-HVR2-His and Ad5H3-HVR2-His + Adjuvant. The values in the ELISA assays were expressed as the Mean ± SD, representing seven independent replicates. Statistical analyses were performed using One-way ANOVA. We sought to evaluate the ability of Ad5H3-HVR2-His in generating His6-specific humoral immunity. Fig. (4A) depicts a schematic of the vector immunization and blood collection timeline. Mice were immunized with Ad3, Ad5H3, Ad5H3-HVR2-His and Ad5H3-HVR2-His + Adjuvant, respectively. Sera from the 3rd bleeding was analyzed by sera-based ELISA to determine the total binding of IgG specific against a KDI peptide containing His6 tag (Fig. 4B). The data showed that the peptide-specific IgG amount in the Ad5H3-HVR2-His sera group was significantly higher than the IgG amount in groups Ad3 and Ad5H3, as p<0.01. The peptide-specific IgG amount in the Ad5H3-HVR2-His + Adjuvant sera group was also significantly higher than the IgG amount in Ad3 and Ad5H3 groups, as p<0.01. This suggested that Ad5H3 with the “Antigen Capsid-Incorporation” strategy could trigger antigen-specific humoral immunity. The merits and drawbacks of Ad5 as a commonly used vector for gene therapies and vaccinations have been stated before. In order to achieve robust immune responses elicited by the Ad5 vector, the priority is to bypass Ad5 PEI, which largely refers to Ad5 NAbs . Ad5 NAbs target epitopes in Ad capsid proteins, of which, hexon is the major target [4, 19-21]. Another study demonstrated that Ad5 NAbs target all seven HVRs of hexon5 , and serotype-specific NAbs against Ad target multiple HVRs of hexons . These findings suggested that replacing hexon5 with other heterologous serotype hexons could lead to greater opportunities for circumventing Ad5 PEI. In this regard, we selected the chimeric Ad5H3 as a new platform for vaccine development. In this study, the goal was to extend the application of this chimeric Ad5H3 towards the improved vaccination approach, in light of Ad5 PEI. For some applications, it is important to develop a strategy for generating antibody-producing vaccines, since these types of vaccines have demonstrated high efficiency in protecting against many infectious diseases [23-26]. Our group and others have applied the “Antigen Capsid-Incorporation” strategy on Ad and validated the induction of robust humoral immunity [13, 14, 16, 18, 27]. Thus, there is potential to apply this underlying strategy on Ad5H3 by incorporating heterologous antigens into hexon3, i.e. His6 tag was selected for proof-of-principle. Previous studies showed that multiple HVRs (HVR1, HVR2, HVR5 and HVR7) on hexon3 could be sites for heterologous antigen incorporation [16, 28]. Based on our previous Ad5 “Antigen Capsid-Incorporated" vectors [14, 29] as well as the literature on Ad3 hexon, we chose H3 HVR2 for the incorporation of a His6 tag, resulting in the construction of plasmid pAd5/H3-HVR2-His, (GL) (Fig. 1). Subsequently, we achieved a unique viable chimeric vector, Ad5H3-HVR2-His. The incorporation, antigenic presentation, and exposure of His6 on the capsid surface of the viral vector were validated by western-blot analysis (Fig. 2B) and ELISA (Fig. 2C). The viral titers and relative VP/IP ratio (Table 1) suggested the fitness of Ad5H3-HVR2-His. Both the chimeric Ad5H3 and Ad5H3-HVR2-His vectors demonstrated significantly lower binding to Ad5-positive sera in an ELISA assay (Fig. 3A) and the abilities to escape Ad5 sera neutralization in an in vitro neutralizing assay (Fig. 3B), which suggested the possibility of the chimeric vectors to circumvent in vivo Ad5 PEI. These data and data-driven suggestions were consistent with a previous study that Ad5H3 and Ad5 don’t cross neutralize each other both in vitro and in vivo . The failure of the chimeric vectors to exhaustively circumvent Ad5-positive sera could be explained by two theories. One theory is that the NAbs in Ad5-positve sera also target other major viral capsid proteins (fiber and penton base), although these proteins are not the major targets of Ad5 NAbs [19, 20]. One consideration is the immunization route by which the vector is administered. The previous study demonstrated that Ad5 could thoroughly circumvent neutralization by Ad5H3 and vice versa, when the viral vectors were intravenously administered in mice. But when changed to intramuscular administration, immunizations would elicit much higher immune responses than intravenous injection . The higher immunity could contribute to the incomplete escape of the chimeric vectors to Ad5-positive sera. Ad5H3-HVR2-His elicited specific humoral immunity against the KDI peptide containing His6 (Fig. 4B). Use of an adjuvant didn’t increase the KDI peptide-specific total IgGs, indicating that adenovirus could act as adjuvant . Construction of vectors that have the ability to circumvent Ad5 PEI, present antigens to produce an antigen-specific humoral response, and transduce cells through a major Ad receptor pathway could have major vaccine implications. Taken together, this study is one of the first studies to extend the chimeric Ad5H3 towards the application of vaccination approach. The chimeric Ad5H3 vector together in combination with the “Antigen Capsid-Incorporation” strategy could be beneficial in eliciting robust humoral immune responses and generating potent and safe antibody-producing vaccines. Construction of vectors that have the ability to circumvent Ad5 PEI, present antigens to produce an antigen-specific humoral response, and transduce cells through a major Ad receptor pathway could have major vaccine implications. Taken together, this study is one of the first studies to extend the chimeric Ad5H3 towards the application of vaccination approach. The chimeric Ad5H3 vector together in combination with the “Antigen Capsid-Incorporation” strategy could be beneficial in eliciting robust humoral immune responses and generating potent and safe antibody producing vaccines. LLG and QLM designed the study; LLG, MI, VK, AK and AEJ performed the experiments; LLG, AK and QLM analyzed the data; LLG and QLM wrote the manuscript; LLG, AK, and QLM critically revised the manuscript. All authors gave final approval of the article to be published and agree to be accountable for all aspects of the work. This work was supported by the National Institutes of Health grant #5R01AI089337-03 and Departmental Funds. The funders had no role in study design, data collection and analysis, decision to publish, or preparation of the manuscript. Research reported in this publication was supported by the National Center for Advancing Translational Research of the National Institutes of Health under award number UL1TR001417. Qiana L, Matthews LG, Krendelchtchikov A, Li Zan C. Viral Vectors for Vaccine Development INTECH 2013. Sun C, Zhang Y, Feng L, et al. Epidemiology of adenovirus type 5 neutralizing antibodies in healthy people and AIDS patients in Guangzhou, southern China. Vaccine 2011; 29(22): 3837-41. Sumida SM, Truitt DM, Kishko MG, et al. Neutralizing antibodies and CD8+ T lymphocytes both contribute to immunity to adenovirus serotype 5 vaccine vectors. J Virol 2004; 78(6): 2666-73. Lasaro MO, Ertl HC. New insights on adenovirus as vaccine vectors. Mol Ther 2009; 17(8): 1333-9. Zeng Q, Han J, Zhao D, Gong T, Zhang Z, Sun X. Protection of adenovirus from neutralizing antibody by cationic PEG derivative ionically linked to adenovirus. Int J Nanomedicine 2012; 7: 985-97. Roberts DM, Nanda A, Havenga MJ, et al. Hexon-chimaeric adenovirus serotype 5 vectors circumvent pre-existing anti-vector immunity. Nature 2006; 441(7090): 239-43. Xin KQ, Jounai N, Someya K, et al. Prime-boost vaccination with plasmid DNA and a chimeric adenovirus type 5 vector with type 35 fiber induces protective immunity against HIV. Gene Ther 2005; 12(24): 1769-77. Wu H, Dmitriev I, Kashentseva E, Seki T, Wang M, Curiel DT. Construction and characterization of adenovirus serotype 5 packaged by serotype 3 hexon. J Virol 2002; 76(24): 12775-82. Short JJ, Rivera AA, Wu H, et al. 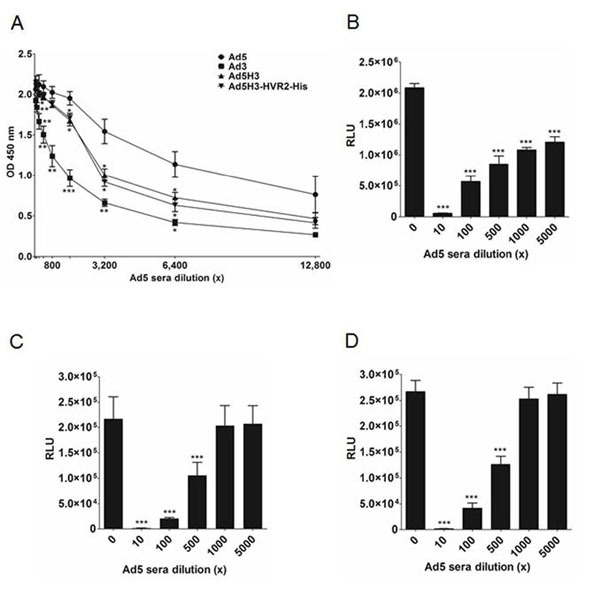 Substitution of adenovirus serotype 3 hexon onto a serotype 5 oncolytic adenovirus reduces factor X binding, decreases liver tropism, and improves antitumor efficacy. Mol Cancer Ther 2010; 9(9): 2536-44. Sharma A, Krause A, Xu Y, Sung B, Wu W, Worgall S. Adenovirus-based vaccine with epitopes incorporated in novel fiber sites to induce protective immunity against Pseudomonas aeruginosa. PLoS One 2013; 8(2): e56996. Palma C, Overstreet MG, Guedon JM, et al. Adenovirus particles that display the Plasmodium falciparum circumsporozoite protein NANP repeat induce sporozoite-neutralizing antibodies in mice. Vaccine 2011; 29(8): 1683-9. Gu L, Li ZC, Krendelchtchikov A, Krendelchtchikova V, Wu H, Matthews QL. Using multivalent adenoviral vectors for HIV vaccination. PLoS One 2013; 8(3): e60347. Matthews QL, Fatima A, Tang Y, et al. HIV antigen incorporation within adenovirus hexon hypervariable 2 for a novel HIV vaccine approach. PLoS One 2010; 5(7): e11815. Farrow AL, Rachakonda G, Gu L, et al. Immunization with Hexon modified adenoviral vectors integrated with gp83 epitope provides protection against Trypanosoma cruzi infection. PLoS Negl Trop Dis 2014; 8(8): e3089. Tian X, Su X, Li X, et al. Protection against enterovirus 71 with neutralizing epitope incorporation within adenovirus type 3 hexon. PLoS One 2012; 7(7): e41381. Xue C, Tian X, Li X, Zhou Z, Su X, Zhou R. Construction and characterization of a recombinant human adenovirus type 3 vector containing two foreign neutralizing epitopes in hexon. Virus Res 2014; 183: 67-74. Gu L, Krendelchtchikova V, Krendelchtchikov A, Oster RA, Fujihashi K, Matthews QL. A recombinant adenovirus-based vector elicits a specific humoral immune response against the V3 loop of HIV-1 gp120 in mice through the “Antigen Capsid-Incorporation” strategy. Virol J 2014; 11(1): 112. Gahéry-Ségard H, Farace F, Godfrin D, et al. Immune response to recombinant capsid proteins of adenovirus in humans: antifiber and anti-penton base antibodies have a synergistic effect on neutralizing activity. J Virol 1998; 72(3): 2388-97. Bradley RR, Lynch DM, Iampietro MJ, Borducchi EN, Barouch DH. Adenovirus serotype 5 neutralizing antibodies target both hexon and fiber following vaccination and natural infection. J Virol 2012; 86(1): 625-9. Bradley RR, Maxfield LF, Lynch DM, Iampietro MJ, Borducchi EN, Barouch DH. Adenovirus serotype 5-specific neutralizing antibodies target multiple hexon hypervariable regions. J Virol 2012; 86(2): 1267-72. Qiu H, Li X, Tian X, et al. Serotype-specific neutralizing antibody epitopes of human adenovirus type 3 (HAdV-3) and HAdV-7 reside in multiple hexon hypervariable regions. J Virol 2012; 86(15): 7964-75. Ge J, Wang X, Tian M, et al. Novel in-ovo chimeric recombinant Newcastle disease vaccine protects against both Newcastle disease and infectious bursal disease. Vaccine 2014; 32(13): 1514-21. Kim EH, Park HJ, Han GY, et al. Intranasal adenovirus-vectored vaccine for induction of long-lasting humoral immunity-mediated broad protection against influenza in mice. J Virol 2014; 88(17): 9693-703. Xu L, He D, Li Z, et al. Protection against lethal enterovirus 71 challenge in mice by a recombinant vaccine candidate containing a broadly cross-neutralizing epitope within the VP2 EF loop. Theranostics 2014; 4(5): 498-513. Dupuy LC, Richards MJ, Ellefsen B, et al. A DNA vaccine for venezuelan equine encephalitis virus delivered by intramuscular electroporation elicits high levels of neutralizing antibodies in multiple animal models and provides protective immunity to mice and nonhuman primates. Clin Vaccine Immunol 2011; 18(5): 707-16. Baden LR, Walsh SR, Seaman MS, et al. First-in-human evaluation of a hexon chimeric adenovirus vector expressing HIV-1 Env (IPCAVD 002). J Infect Dis 2014; 210(7): 1052-61. Zhou ZC, Liang HX, Li T, et al. The modified restriction of amino acids of HVR1, HVR2, HVR5, HVR7 in human adenovirus serotype 3 hexon. Bing du xue bao = Chinese J Virol 2012; 28(4): 372-81. Matthews QL, Yang P, Wu Q, et al. Optimization of capsid-incorporated antigens for a novel adenovirus vaccine approach. Virol J 2008; 5: 98. Wang TL, Ling M, Shih IM, et al. Intramuscular administration of E7-transfected dendritic cells generates the most potent E7-specific anti-tumor immunity. Gene Ther 2000; 7(9): 726-33. Geutskens SB, van der Eb MM, Plomp AC, et al. Recombinant adenoviral vectors have adjuvant activity and stimulate T cell responses against tumor cells. Gene Ther 2000; 7(16): 1410-6.